This might be the most exciting exoplanet news yet. 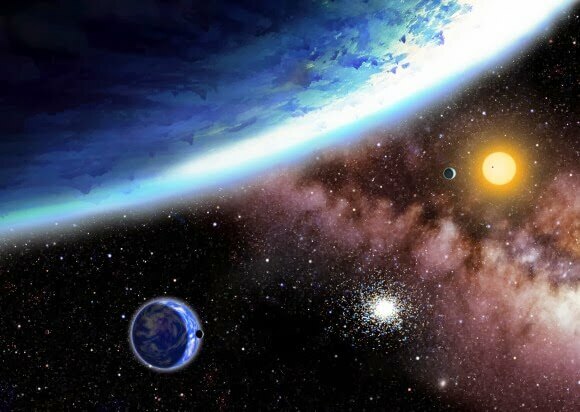 An international team of scientists analyzing data from NASA’s Kepler mission has found a planetary system with two small, potentially rocky planets that lie within the habitable zone of their star. The star, Kepler-62, is a bit smaller and cooler than our Sun, and is home to a five-planet system. Two of the worlds, Kepler-62e and Kepler-62f are the smallest exoplanets yet found in a habitable zone, and they might both be covered in water or ice, depending on what kind of atmosphere they might have. “Imagine looking through a telescope to see another world with life just a few million miles from your own. Or, having the capability to travel between them on a regular basis. I can’t think of a more powerful motivation to become a space-faring society,” said Harvard astronomer Dimitar Sasselov, who is co-author of a new paper describing the discovery. Kepler-62 in the constellation Lyra, and is about 1,200 light-years from Earth. 62e is 1.61 times Earth’s size, circles the star in 122.4 (Earth) days. 62f is 1.4 times the size of Earth, and orbits its star in 267.3 days. Previously, the smallest planet with known radius inside a habitable zone was Kepler-22b, with a radius of 2.4 times that of the Earth. A third planet in another star system was also announced at a press briefing today. 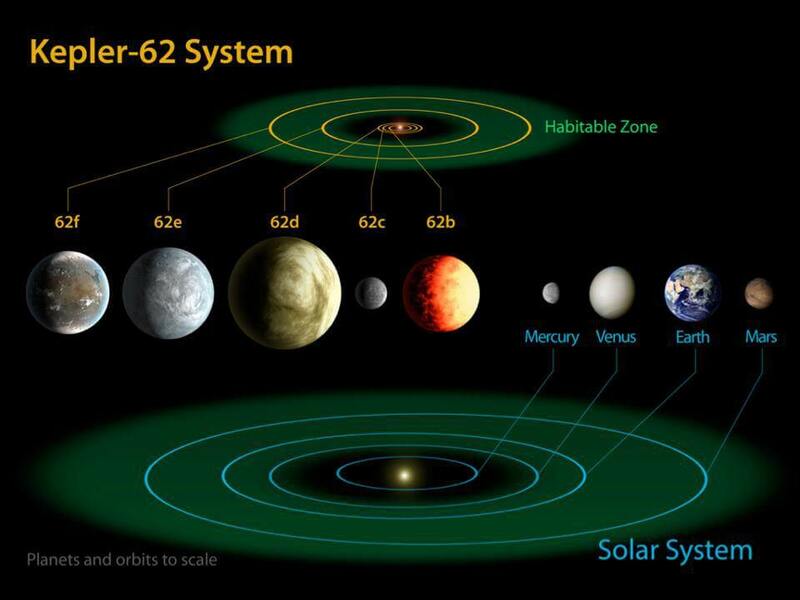 Kepler-69c is 70 percent larger than the size of Earth, and orbits in the habitable zone of a star similar to our Sun. Researchers are uncertain about the composition of Kepler-69c, but astronomer Thomas Barclay from the BAER Institute said its closer orbit of 242 days around a Sun-like star means it is likely more like a super-Venus rather than a super-Earth. The team says that while the sizes of Kepler 62e and 62f are known, their mass and densities are not. However, every planet found in their size range so far has been rocky, like Earth. The Kepler spacecraft is able to detect planets that transit or cross the face of their host star. Measuring a transit tells astronomers the size of the planet relative to its star. 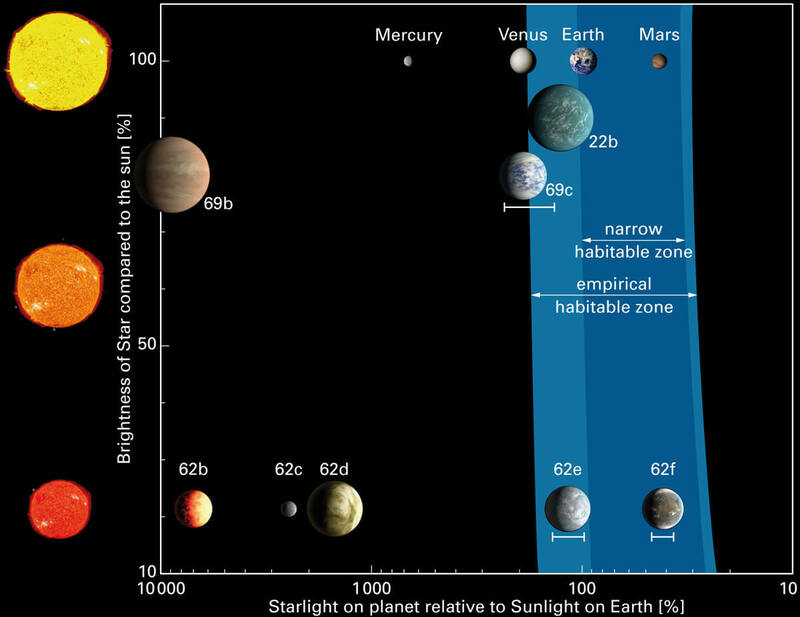 “What makes Kepler-62e and Kepler-62f so exciting is a combination of two factors,” Kaltenegger added. “We know their radius, which indicates that these are indeed rocky planets, and they orbit their star in the habitable zone. That makes them our best candidates for habitable planets out there yet.